Morgan Stanley will convert all “Class C” mutual fund shares held by customers for six or more years to load-waived “A” shares that pay brokers lower annual fees, according to sources familiar with a memo being sent to its almost 16,000 financial advisors this afternoon. The change will affect brokers who sell funds in commission-based transaction accounts, rather than in the fee-based advisory accounts that Morgan Stanley and other companies prefer because those accounts produce ongoing annual income and help firms avoid charges of favoring investments with higher commissions. The volume of higher-expense C shares that are sold industrywide has been declining due to heightened investor sensitivity to fund expense ratios and firm sensitivity to regulatory oversight, but a significant number of brokers sell them. They argue that the C shares, which generally pay brokers 1% of the value of their customers’ fund share holdings annually rather than the .25% trail on A shares, benefit long-term investors will pay less in a commission than in an advisory account. And some customers simply who dislike paying upfront “load” on new A-share purchases. Several Morgan Stanley brokers told AdvisorHub that they plan to “flip” C shares, selling out of one fund into another’s similar share class as they approach conversion date so that they can continue collecting the higher so-called 12b-1 fee, or trail. Officials at brokerage firms counter that they have strong surveillance systems that can catch such flipping patterns. C shares continue to be appropriate for investors with short-term investment horizons because there is no upfront charge, they say, but that effect is dissipated by long-term annual payments to brokers. Merrill Lynch several years ago adopted a policy that converts customers C shares to A shares on all of its thousands of funds after 10 years unless a particular fund company has a more advantageous conversion requirement. Few fund companies have such conversion requirements, although American Funds and Ivy Funds have a ten-year requirement. The changes come as brokerage firms have become more sensitive to compensation issues in the buildup to the DOL fiduciary rule that affected customer-care standards in tax-friendly retirement accounts and as the Securities and Exchange Commission prepares a fiduciary standard for taxable accounts. C shares also are generally more popular with smaller investors, a population that many firms have been guiding advisors away from. Morgan Stanley generally does not pay brokers on household accounts below $100,000 and Merrill Lynch excludes accounts under $250,000 from brokers’ compensation grids. Despite their status as a revenue staple for many brokers, C-share sales have been waning. Total assets held in the share-class as of last month had fallen 15% to $581.2 billion from $105.6 billion ten years earlier, according to Broadridge Inc.
A net $105.2 billion left mutual fund C shares in the past 12 months, and $233 billion has fled the high-trail share class over the past three years across all fund asset classes as of the beginning of February, notwithstanding robust stock and bond markets in the periods, according to Broadridge. Morgan Stanley’s memo to its brokers on Tuesday also will indicate that the firm will continue to eliminate certain mutual funds from its platform that have not performed well or that have not attracted many assets. Last year the company began the winnowing process, and excluded Vanguard Funds from its platform because the company will not pay brokerage firms for so-called shelf space. 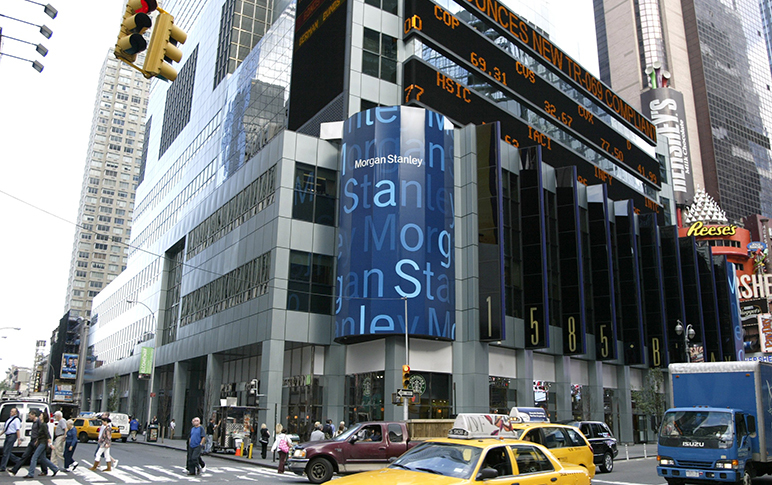 Morgan Stanley also is adding incentives to encourage its brokers to collect more cash from their investment customers, another growing trend among big firms that have commercial banking affiliates. Effective Thursday, Morgan Stanley is raising the interest rate it will pay depositors, with the increase higher for larger deposits. As of August 1, the firm also will reinstate a revenue credit to brokers of 5 basis points of the average balance in a client’s deposit account. The credit will be applied only to deposits and other short-term liquidity products held in non-advisory accounts to avoid a double payment to brokers, the sources said. The company also will eliminate the option of allowing new customers to have cash in their investment accounts swept into money-market accounts as of April 9, a move that several bank-affiliated competitors have also instituted since banks make wider spreads on bank deposits. The conversion from money-market to bank deposit account for existing clients will occur on August 13. To placate investors upset over what is likely to be marginally lower returns on their cash, Morgan Stanley will guarantee a preferred interest rate in the bank deposit program that will exceed what they were receiving in the money fund for at least six months. In another signal of its sensitivity to pricing, Morgan Stanley is lowering the maximum fee it will charge clients in its Consulting Group managed account programs to 2.0% from around 2.5% as of October 1, 2018, said people familiar with contents of the memo that is being sent to the firm’s “field” by its regional directors. Swap those C shares into B shares, and then into a variable annuity after that. Just make sure you that your ROA is under 1 so that you keep under the compliance radar. Who cares about the client, there are no footnotes to gross production. Cut Gormans Salary and the managers salaries by 75% and reimburse that to the clients. How much more blood(cash) can broker dealers get from the (advisor) turnip? and now broker dealers can do almost anything they want to advisers in the holy name of the DOL. What a mess. > Reply to Happy to be gone from MS. I guess th we wirehiuse firms want active management in accounts…. so if u keep client assets in 4 and 5 star funds in C shares, that does promote some active management that will both benefit the client and refresh the clock on c shares. Advisory is not right for everyone. When the next bear market arrives… these wire houses will realize they made a huge mistake. I left Wells to go independent…. and other FA’s should do the same. If these wirehouse firms don’t look out for their clients or their advisors…. they are stupid , shortsighted, and therefore worthless. It’s a broken model… and these firms broke it out of greed. I’m far happier with my 80 pct new payout and not having to answer to the man over stupid stuff. C shares are good for clients and costs less than these advisory accounts. This should not be a big deal.